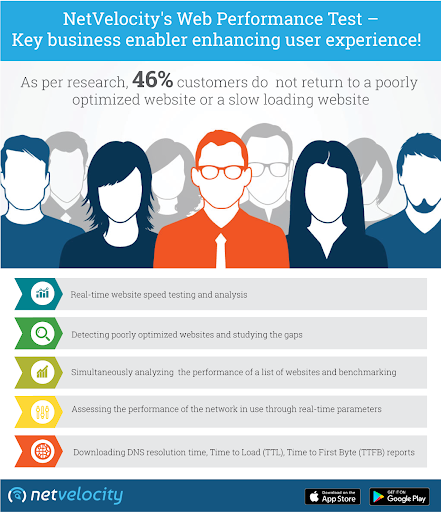 Home/Web Performance Test/NetVelocity’s Web Performance Test – Key business enabler enhancing user experience! For any internet user, it is highly annoying when trying to open a website for an important task takes a lot of time. The performance of a company’s websites, pages and applications affect the business more than what the management would presume. As a result, top performing organizations consider the web performance not just as a nice-to-have service, but as a crucial feature of their offerings. Unfortunately, most organizations do not regularly test the performance and scalability of their web infrastructure and end up spoiling the customers’ experience of their web services, drifting them farther from their products and services. When enterprises understand that performance is the key to a great user experience and that delivering the best website experience to users is of paramount importance, slow and steady page-load times just won’t do. Thus, it is crucial to analyze the website’s speed on a regular basis. Not only does the good website speed increase the ranking in search engines like Google but also enhance customer engagement, retention, and conversion.